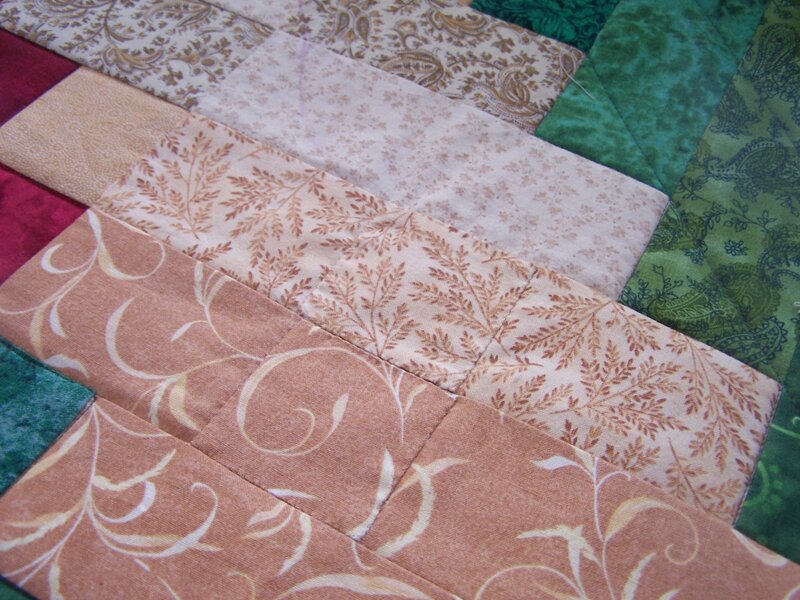 This weekend, I was marking a feather spine on my log cabin variation quilt I have been posting. And, I found a tiny rip in one of the logs. And, then another in the log right below it. I have no idea how they got there. My first thought was one of my pins I had used to baste it as I was stabilizing. But, I don’t know how one pin ripped the quilt in two different logs. I’m still thinking that scenario is the most likely culprit, but for the life I me I can’t figure out exactly how. Once the shock wore off and it fully sunk in, my first reaction was @#$##!, quickly followed by just wanting to melt into a tearful puddle on my quilting room floor, to moving to a plan of action. I have to fix this somehow! I have too much work and fabric invested. I was way past the point of taking it apart and piecing in new logs. That would have involved too much frogging and requilting. I have plenty of extra fabric, so I got scraps from the two pieces involved, matched up the print, and appliqued two square “patches” over top of each rip. I think once it quilted, it will hardly be noticeable. Still, it was a bit disheartening and made me feel a little sick. But, in the grand scheme of life, this is not really a problem…merely a little situation. And, I know the recipient is still going to love it. Let me add at this point, that this is NOT a client quilt, thankfully, or I would have been hysterical. I don’t know if I have mentioned, that shortly after Greg passed away, I stopped quilting for hire. 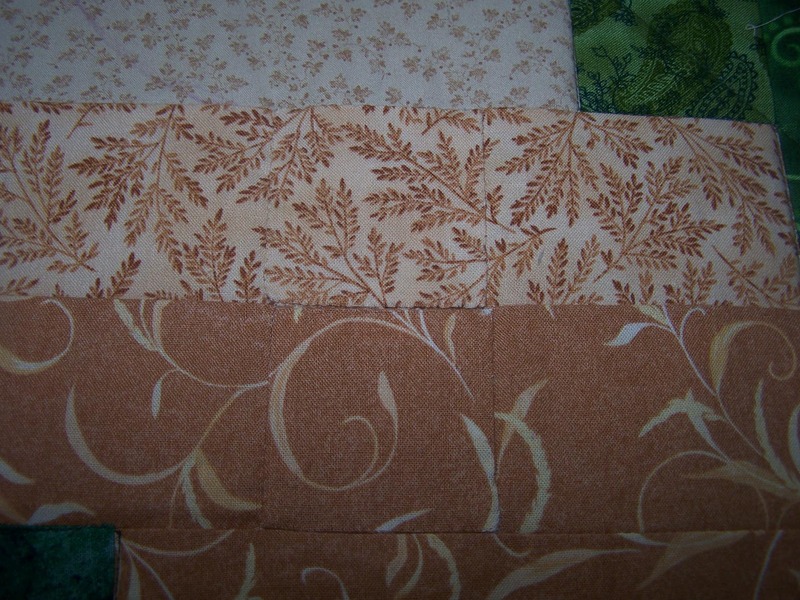 I only work on my own stuff now, and as much as I loved quilting for others, it has eased some stress in my life. I didn’t think to take a pic til I had already repaired one of them, but this is what they both looked like. The purple you see is from my erasable fabric marker I was marking the spine with, then I circled the rip with it. This is after both had been patched. Not too bad, I think. It will have to do, regardless. Feel free to add your comments regarding how you would have fixed it, had it been yours. That might make for some interesting discussion, as well as being helpful to someone else finding themselves in the same situation. Again, keep in mind, this is not a customer quilt. Along that line, what would you have done if it was a customer quilt? For sure, they would need to be involved in the decision making process, I think. On the quilting front, things didn’t get much better after that. I began to “feather” the spine, and being that I am a little out of practice, I did not at all like the “flow” or look of the first few I stitched, so I stopped and am frogging them. I hate frogging, so I do a little, then leave it for a bit, do a little, then leave it. It may take a few days to get the few I quilted back out, lol. Eventually, I will let you know how they finally turned out, hehe. I think your repair is absolutely acceptable!! Good job!! You repair looks great! 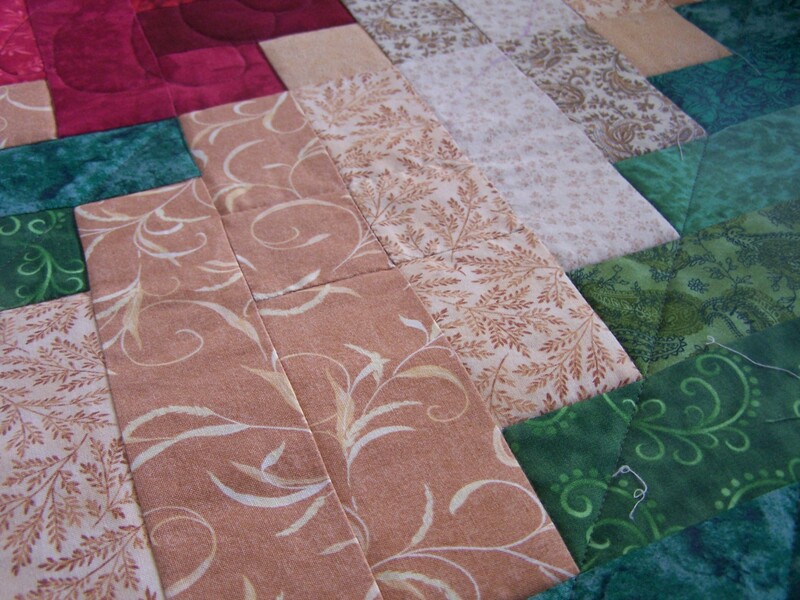 Once it’s finished, quilting and washed, I bet you will struggle to find it! You replaced it perfectly. NO ONE will be able to tell. Great job! Sometimes we beat up on ourselves when we make a mistake. I’ve actually had this happen to a customer quilt. I had NO IDEA how it happened, but it did. I called her, we discussed options, and she couldn’t find it when I was done. But still, I was beside myself and gave her a discount because of it. I feel your pain. When we work so hard on something and then find an unseen before flaw, it is quite disheartening. That happend to me this week in a baby quilt I am almost finished with. A flaw in the fabric that I didn’t see until I had the whole top put together. I gave some consideration to taking it apart but then remembered it is a baby quilt to be used and abused. Also, no one in my family looks closely at the quilts they get (no sewers or quilters amoung all of them) so it is going just as it is. Some things are just too small to get all worked up over. A rip is not quite as small as my very little flaw but you handled it perfectly. I have been there and feel your pain. 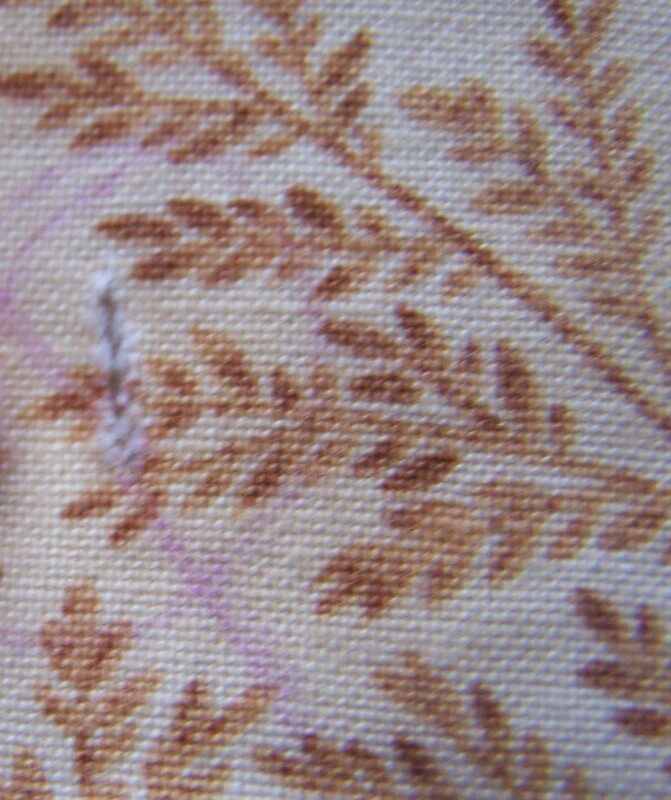 I got some more of the same fabric, placed it under the slit, lined up the pattern, then sprinkled some of that mending powder which melts with heat under the slit, blew of any excess and used the edge of my iron to set it. I can still see it but when it has won ribbons at shows, I have pointed out the repair to others and they still can’t find it even though I am pointing right at it. I had that happen once to my own quilt. It came to me months later that I had dropped a rotary cutter on it. When I dropped the cutter, I didn’t really think about it. You did a beautiful repair. No one will ever see it. I appliqued a few things on mine to disguise it. Looks great Randi!!! Won’t even notice once it is quilted. 🙂 I’ve been there too!! I was cutting some fabric from the back of appliqué and cut right into my quilt!!! I was so horrified I had to walk away for a few days. It was a wall hanging. I used some fusible and heavily quilted it. I can’t even find the spot now!!! 🙂 it makes for a fun story now. Lol! Take care ! You repaired your quilt perfectly! It’s what I would have done and will be very hard to find once it’s quilted.